Hillary Coniglio raises her castanets in an ancient Italian worship dance at the Twelfth Annual Festa of the Madonna del Tinadari in New York. Photo © Cheryl Nemazie. There was no sign of the Black Madonna of Tindari statue that used to stand in this room, but the ancient spirit of Sicily rose again like the phoenix painted on the wall of this East Village bar anyway. Devotees and revelers of all ages gathered on her feast day September 8 in a revival of the celebration that anchored this immigrant community for more than 75 years. In a small side room that used to serve as chapel for a statue, wrought-iron chandeliers still hang from the ceiling. Sicilians young and old are huddled on wooden benches with pints of beer while a group of fresh-faced twentysomethings play traditional instruments that haven’t been heard in hundreds of years. 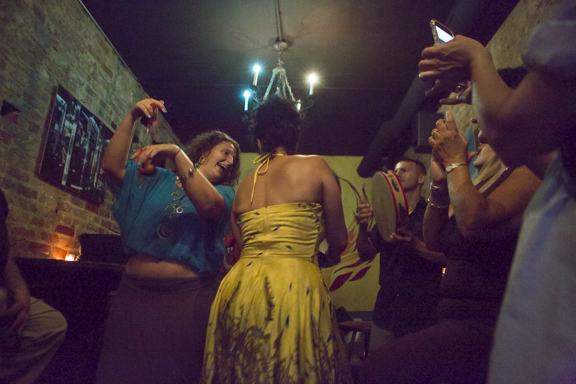 Dancers stomp and twirl in ancient dances in honor of the Black Madonna while the same songs that have been sung in her honor for eons wake up the memories in the room. 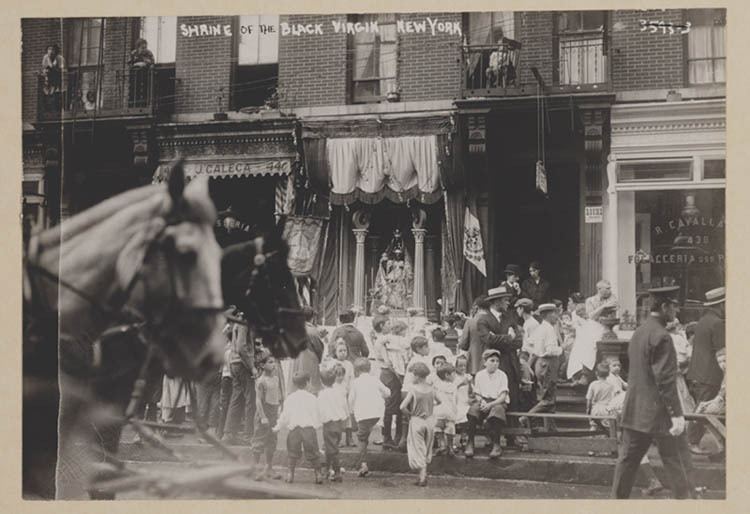 Sicilian immigrants brought their religious beliefs and practices with them from the Old World to this Manhattan neighborhood at the turn of the 20th century, especially their devotion to the Blessed Mother, particularly the Madonna del Tindari, the black Madonna of Sicily. However, 12 years ago, Italian-American scholar Joseph Sciorra had an idea to resurrect the feast day gathering, with a modern twist. The site of the chapel at 447 East 13th Street is now a bar called the Phoenix Bar. Dozens of Sicilians turned out for the revival. Charlie Castrovinci (like Fidel and Leonardo, he says) used to come to this very spot to visit the Black Madonna when he was a child. He remembers when this neighborhood was home to 50,000 Sicilians. 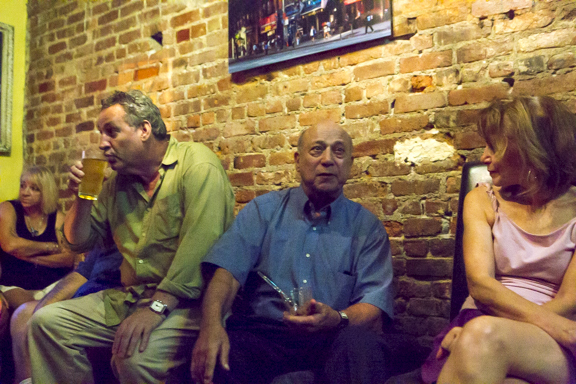 “My block had its own festival, except this block had two feasts of the black Madonna,” he said. He remembers her being paraded through the streets, people pinning ribbons with money to her as donations and offerings, vendors selling sausage and Italian doughnuts filled with ricotta called zepplie (“My mom wouldn’t let me have those because she could make them at home.”), and a bandstand with music. He begins to sing strains of a song he remembers—Mama…—and Victorianne Capiello chimes in. She came to the festival’s revival after doing research on her family history and discovering her ancestors came from areas of Sicily near the original shrine of the Madonna del Tindari. “Every year my grandmother would climb the mountain on her knees and do her novenas and prayers,” she said. She met Charles at a Sicilian meet up—their families it turns out are from the area of Sicily—and now they are friends. “I am happy to be back and willing to share with these newcomers the greatness of the Black Madonna,” said Castrovinci. 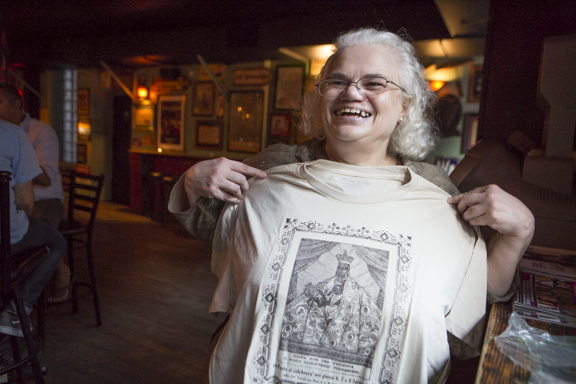 Leda Grasso, who was born in Catania, Sicily, is holding a Black Madonna del Tindari commemorative t-shirt from a number of years ago. It depicts one of the original flyers for the event from the early 20th century. Her mother also made the pilgrimage to Tindari. Cups of traditional Sicilian chocolate rice pudding are passed around. Beers are downed. The lights are low. 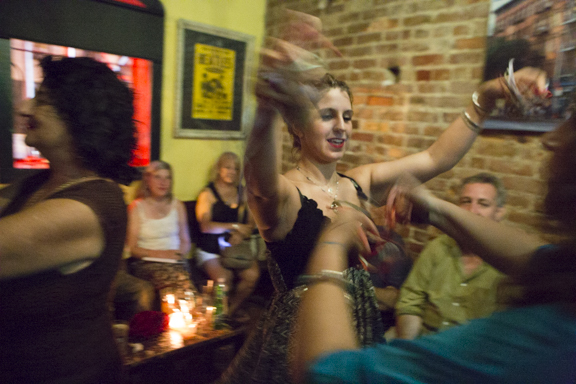 Dancer Rita Fierro spins to the rhythm, dipping and turning around the other dancers as if they are ready for a rumble. 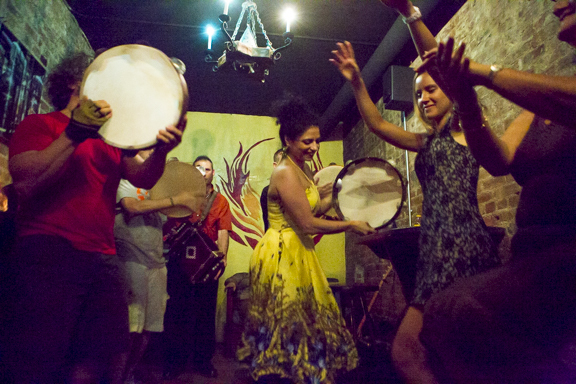 They hop back and forth to the drums, hair flying, hands in the air snapping castanets, as the beat thrums faster and faster. With her wavy brown hair and dark almond eyes, long flowing skirt and bare feet, swirling with castanets made of olive wood in her hands, Fierro looks like she could be dancing in the ancient streets of Pompeii. In fact, she later tells me, there is a mosaic in Pompeii that shows people doing this very same dance. The tamurriata is meant to generate a trance to reconnect with the spirit, to transcend the physical experience, like spinning Sufis. It’s working. The rest of the women join in the dance. There is joy on their faces. And one wonders if the Black Madonna may appear after all.